How do the ubiquitous Neighbourhood Playgrounds of the past and the ones being built for the future compare? Find out at The More We Get Together, an exhibition at the National Museum of Singapore. Did you know that the neighbourhood playground where you played “catching”, hung upside down on monkey bars, run though tunnels, and more, turns 100 in the year 2030? 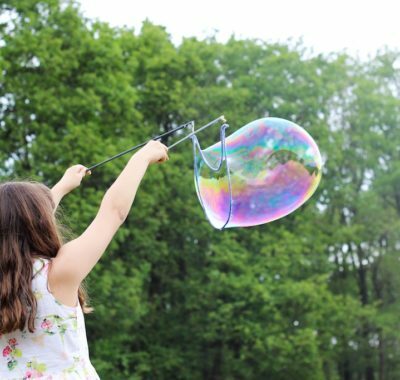 Indeed, many of our fond memories from childhood consists of the time spent at the neighbourhood playground, which has helped many of us make great memories and forge life-long friendships. 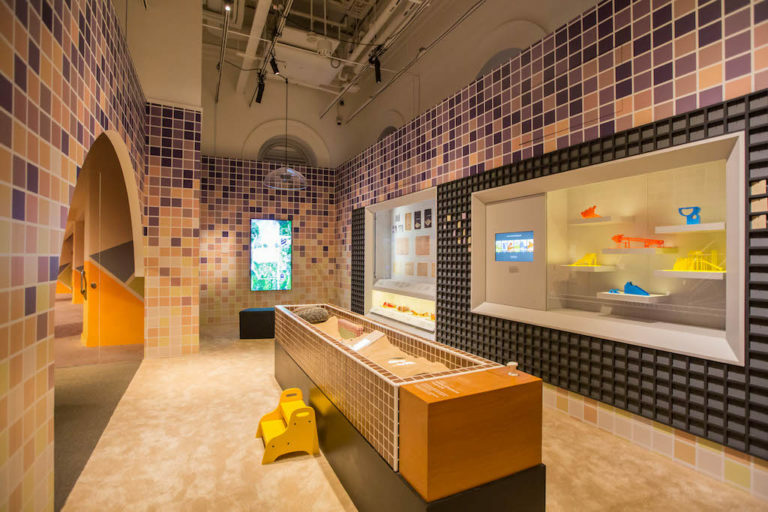 With the neighbourhood playground almost turning 100 years old in 2030, the National Museum of Singapore has put together an exciting exhibition all about playgrounds! 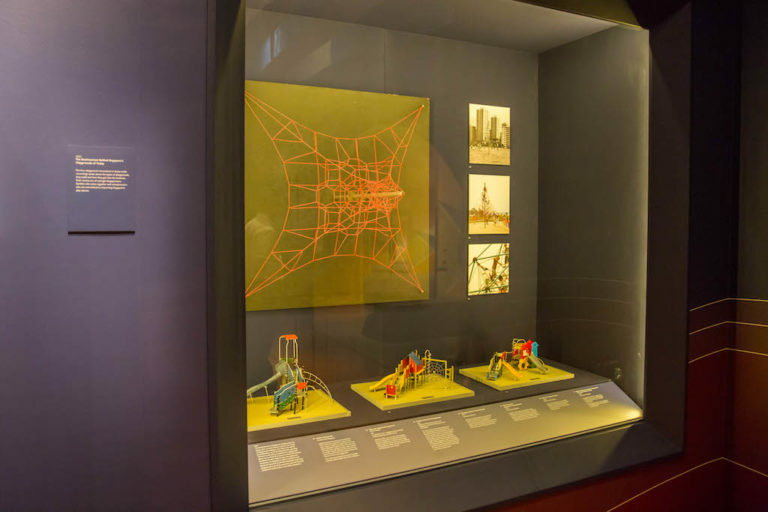 Upon entering the museum, the first thing you’ll notice is this eye-catching exhibit by Matali Crasset. 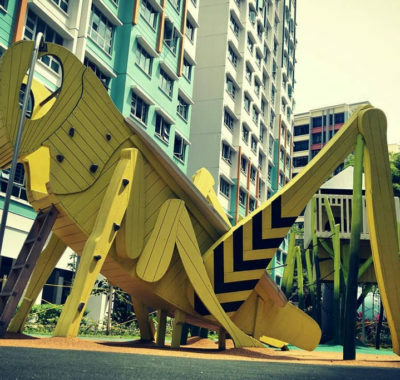 One of the few designs commissioned in Singapore just for toddlers, this play area is unlike any other. Pull the handle on the pole, and watch the ribbons on the ceiling move! For the opening weekend (21 and 22 April), Matali Crasset will be hosting a special workshop for tots. Experience art that builds family bonds in this special workshop crafted for just toddlers and their families. Suitable for children from ages 18 months to 3 years old. Each child must be accompanied by an adult. Embark on a bouncy adventure with Bub as she takes on the interactive inflatable playgrounds! 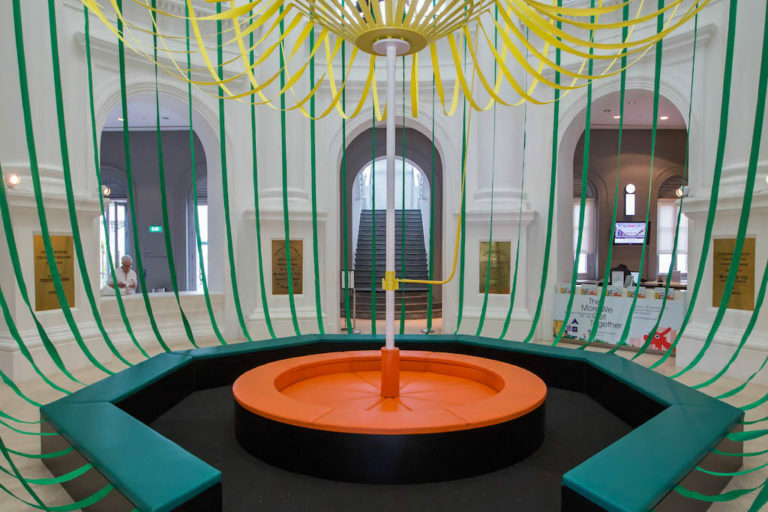 Located at the front entrance of the National Museum of Singapore, these unmissable inflatable playgrounds were inspired by iconic mosaic playgrounds of yesteryear. Maybe you’ll recognise some of them too! The kids can also go on an “animal hunt” with iconic animal springers for even more bouncy fun. As we know, no playground experience is really complete without ice cream! Cool off from the heat and indulge with the kids in Momolato’s fun new ice-cream flavours on the opening weekend! Junior can watch in awe as balloons are sculpted into unique forms of Singapore’s iconic playgrounds! The best part? He’ll get to take one home for free. Balloons are redeemable with a filled-up feedback form from the exhibition during the opening weekend. Looking to visit The More We Get Together exhibition during the school holidays? Be sure to catch the Children’s Season Special! Huddle together for a half-an-hour storytelling session by Esther Eio, on the iconic dragon playground. Join the storytelling session for free with on-site registration. Suitable for children ages 5 and up. 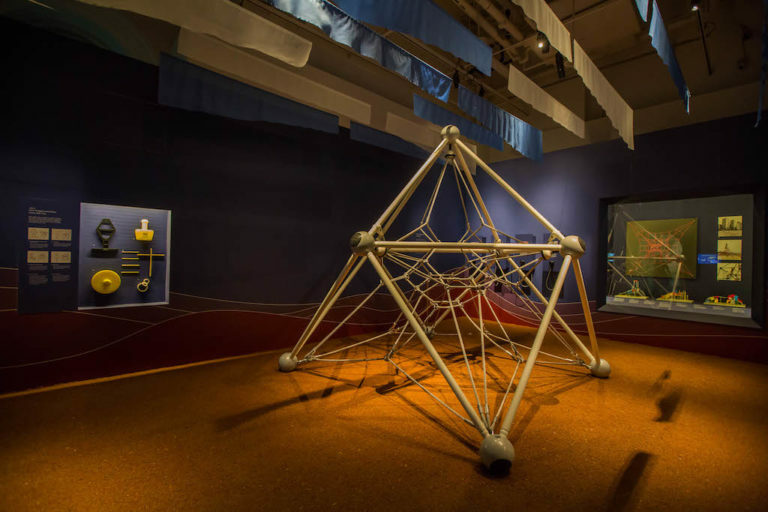 Kids can also enjoy climbing on a rope play structure – a “mini” version adapted from the rope pyramid in West Coast Park. Throughout the exhibition, there’ll also be hands-on opportunities to test safety equipment used by playground inspectors. You’ll also get to “play” on re-imagined versions of playground staples created by SUTD students, such as a see-saw that tilts only when someone sits on it, and a swing for three. Think that your teen couldn’t possibly be interested in playgrounds? Think again! 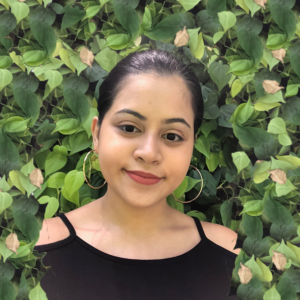 With the exciting exhibition and a line-up of activities catered to teenagers, they’ll be asking to come along to The More We Get Together, too. If your child loves tech and 3D printing, be sure to pop by the 3D printing station! Watch miniature versions of Singapore’s iconic playgrounds as they’re created by 3D printers. If your teen wants to own their own mini 3D creation: visit the exhibition, take a creative snapshot, and upload it to social media with the hashtag #OurSGPlaygrounds. Limited to the first 300 participants per day during the opening weekend. 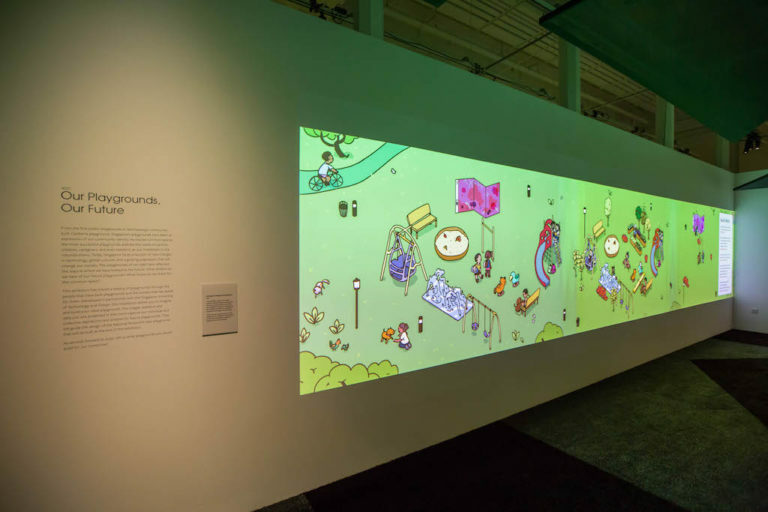 The National Museum’s Young Cinema returns with TimeScapes – A Singapore Anthology, a collection of animated short films about life, love, and landscapes of Singapore past and present. Watch these lovely films together with your teen and reminisces about your shared experiences on the playground! Films will be played on loop during the opening weekend. 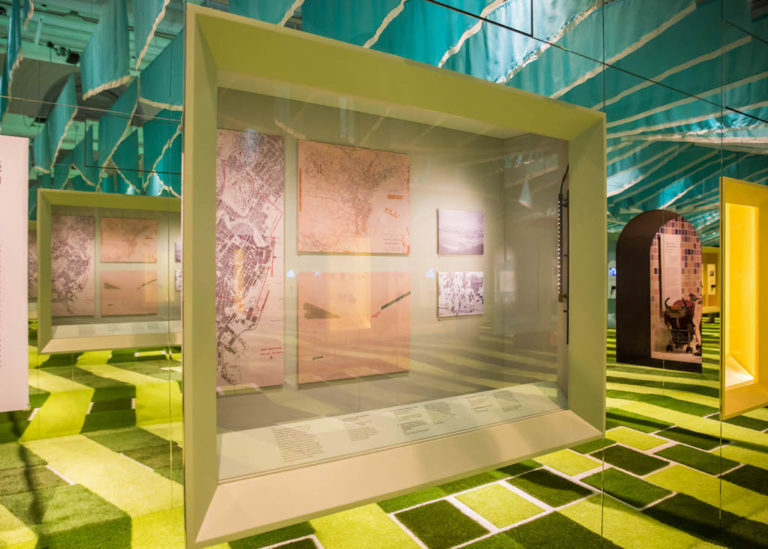 Calling all Secondary 3 students who’d love to “hack a future playground” situated on the grounds of the museum! If Kiddo loves all things tech and engineering, this is perfect for her! Participants will be guided by a team of experts who’ll introduce them to tools used for 3D-modelling. They’ll also get to learn about the process of innovation and functional-design thinking. Limited to 30 participants per session. Other in-gallery activities include a mosaic wall where visitors can pen their playground memories. There’s also a poll on your favourite mosaic playground design, in which you stand a chance to walk away with a 3D-printed model of the design every month! 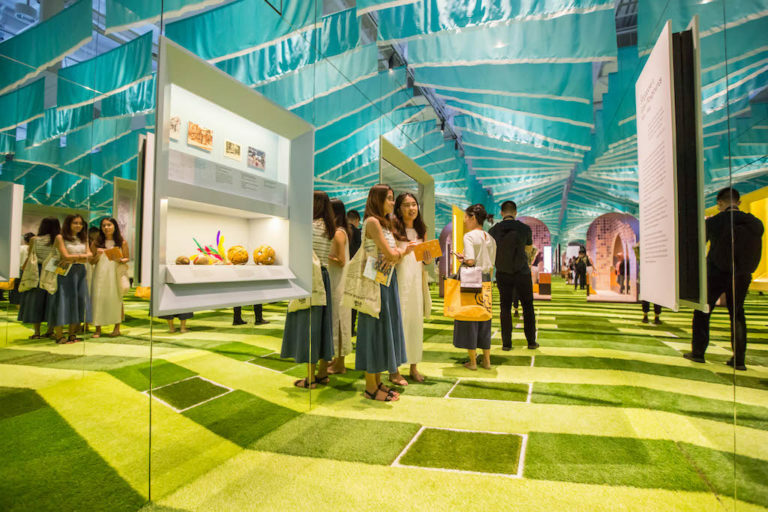 With lots of activities happening during the opening weekend, you’ll want to head down to the National Museum of Singapore on 21 to 22 April! Enjoy learning about playgrounds from past, present, and future; and experience the real meaning of play with the whole family. If your kids are between the ages 5 to 12, be sure to pick up the special playbook that’ll guide them through the exhibition. See you there!